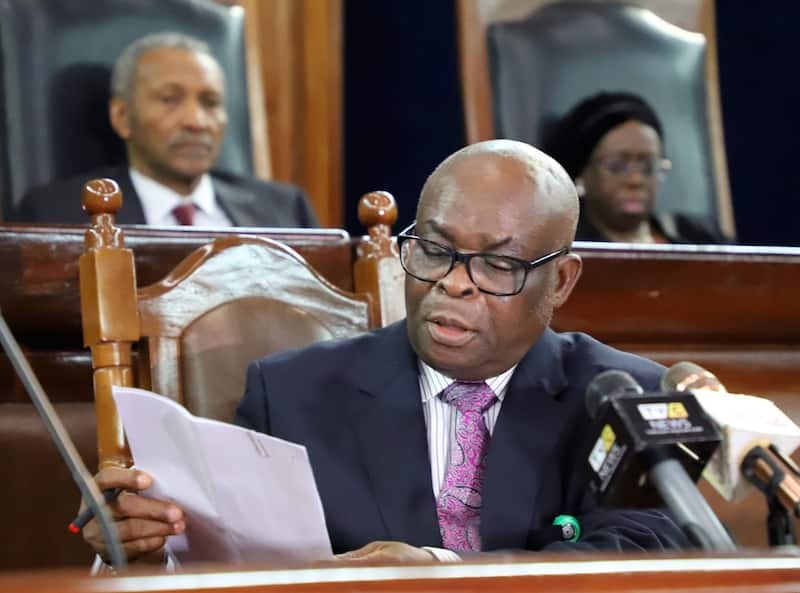 The lead prosecutor in the trial of the suspended chief justice of Nigeria, Justice Walter Onnoghen, has said that the federal government did not table allegation of undeclared $3million against Onnoghen before the Code of Conduct Tribunal. The lead prosecutor, Aliyu Umar (SAN) who made the disclosure on Saturday, March 23, also said all the six charges against Onnoghen made no references to 55 houses. According to him, the federal government only accused Onnoghen of breaching the Code of Conduct Act with his failure to declare and disclose five Standard Chartered Bank’s statement of accounts in his asset declaration form, The Nation reports. Legit.ng notes that Umar said: “There is a lot of falsehood in the public space which I need to correct. The government did not file complaints bordering on $3million and 55 houses against Onnoghen before the Code of Conduct Tribunal. CCB4zg, CCBzh, CCB4zi, CCB4zj and CCB4zk for Onnoghen’s Naira NUBAN Account No. 0001062667 with a balance of N2, 556, 019. 25 as at 11th January 2019." The lead prosecutor added: “Any Nigerian is free to apply for a copy of the charges against Onnoghen at the CCT and he or she will know that they were explicit." Meanwhile, Legit.ng previously reported that Olu Onemole, an aide to the president of the Senate, Bukola Saraki, declared that the decision of the Senate to go to court over the suspension of chief justice of Nigeria, Walter Onnoghen, was supported by the majority. Onemole, special assistant to Saraki on new media, made this known on twitter. He said the senate got the support of majority of the members of its leadership before going to court.